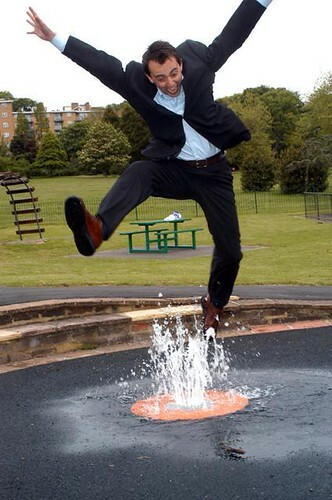 LEWISHAM NEWS: Council Tax Bands and Increases. The Evening Standard ran a feature today regarding Council Tax and specifically the possibility of new Council Tax bandings for properties with a rateable value over £1M - effectively creating a Band I to go over the Band H.
It's all guesswork as the Lyon's Review hasn't been published yet but it gave the Standard an excuse to list how many properties sold for over £1M in 2006. 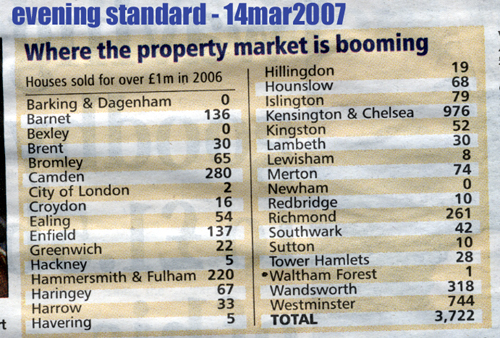 Please note that this isn't how many there are in the boroughs, just those that sold in 2006. The second part of the Council Tax feature was titled "Homeowners taxed £10 more for asylum seekers" and started "A London Council is adding £10 to it's average tax bill to cover the costs of failed asylum seekers." No, not Lewisham, but Hillingdon. Of course, the headline was put next to a table showing Council Tax increases across the London Boroughs which is a bit naughty really considering that the Council Tax increases listed aren't the fault of failed asylum seekers at all but rather a multitude of factors. Anyway, I thought I'd include the list so you can see how Lewisham compares to the rest of London. Interesting stuff. Can't work out whether that means there just aren't that many £1m houses in LBL or whether we've got a more settled population living in those houses. This is what baffled me at first. I think it just means that there was more movement in the £1m+ market in Lewisham than say, City Of London or Newham. My initial incorrect reaction was "They're saying there are only 8 properties worth over £1m in the borough!!!"